Fashioning Feathers: Dead Birds, Millinery Crafts and the Plumage Trade is an exhibition conceived and created by Dr Merle Patchett © 2011. In its first manifestation at the FAB Gallery, University of Alberta the exhibition was co-curated by Dr Merle Patchett and Dr Liz Gomez in association with the Material Culture Institute of the University of Alberta. The exhibition was presented as part of The Material Culture Institute’s 2011 Symposium – Material Culture, Craft & Community: Negotiating Objects Across Time & Place. Fashioning Feathers… is now on tour and opens at the Royal Alberta Museum March 24th 2012. For more information click here for details. Feathers fascinate, feathers are fetishized, feathers are very much back in fashion. This exhibition takes us back to a time when the wings, bodies and heads of birds were used to adorn hats. Fashioning Feathers… explores the complex geographies of collection, production and consumption behind the making of such ‘feather fashions’. From the hunting and killing of birds in their natural habitats, to their processing in metropolitan plumage sweatshops and crafting by professional and amateur milliners, to their becoming adornments on the heads of women in Europe and North America. With all these human designs on bird feathers Fashioning Feathers… enlists the artwork of contemporary artists Kate Foster and Andrea Roe to help engage our curiosity to wonder at how birds use their feathers – and what we do to birds in the process of fashioning them. By tracing the movement of these commodities across time and place (and between states of life and death) the exhibition extends cultural geography methodology into an exhibitionary context and aims to develop upon non-anthropocentric approaches to the interpretation and display of animal remains. The exhibition will exhibit examples of millinery prepared bird skins and feathered hats from the University of Alberta Clothing and Textiles Collection alongside the millinery guides and craft tools that made the making of such ‘feather fashions’ possible even in domestic settings. These will then be juxtaposed with the display of archival photographs of women working in metropolitan ‘plumage sweatshops’ and ‘murderous millinery’ campaign materials from the Audubon Society to expose the darker side of the mass production of feathered garments. A further dimension to the exhibition will be the installation of artworks by contemporary artists whose work in some way explores complex human-avian relations associated with the plumage trade and taxidermy practice, including Biography of a Lie and Apoda by Kate Foster and Kingfisher and Intimate by Andrea Roe. This website is intended to act as an online catalogue and extended exhibitionary space for Fashioning Feathers… In this way we seek to create a virtual space of engagement for those unable to attend the material manifestation of exhibition at the FAB Gallery, University of Alberta. Birds of Paradise – this space explores the relationships, practices and geographies behind the making and presence of millinery bird of paradise specimens in a clothing and textiles collection in Western Canada. It includes audio and video recordings of birds of paradise in their natural habitats courtesy of the Cornell Lab of Ornithology. Fashioning Feathers – this space explores the production processes involved in ‘fashioning’ feathers, from the harvesting of birds for their feathers on ‘feather farms’, to the crafting of feathers by plumassiers and in plume sweatshops. Muderous Millinery – this space seeks to outline the extent of the business of killing birds for the millinery trade and to evidence the efforts of various individuals and groups to bring an end to the international plumage trade. Ruffling Feathers – this space enlists the artwork of contemporary artists Kate Foster and Andrea Roe to help engage our curiosity to wonder at how birds use their feathers – and what we do to birds in the process of fashioning them. 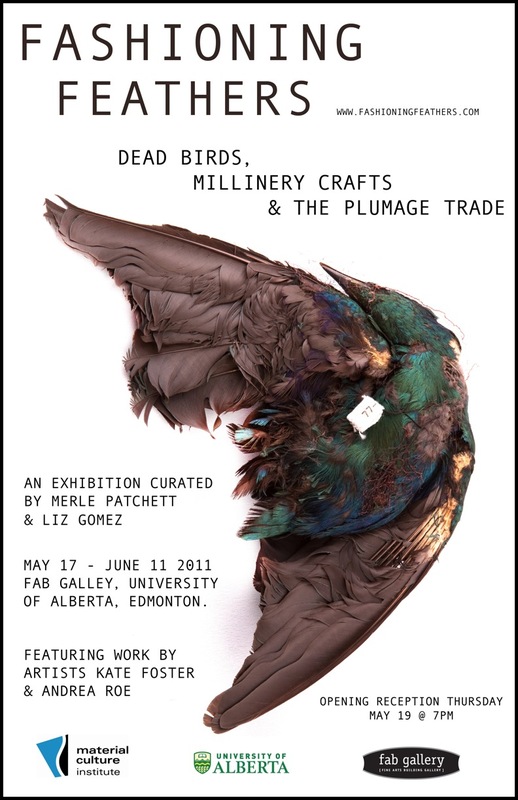 The blog is dedicated to documenting the making of Fashioning Feathers… As we go behind the scenes and under the skin of the millinery preserved avian parts in store at the University of Alberta Clothing and Textiles Collections we draw attention to their excessive sensory, bodily and affective registers. N.B. This exhibition arises out of doctoral and postdoctoral research carried out by Dr Merle Patchett and pre-existing collaborative curatorial relationships between her and the artists Kate Foster and Andrea Roe. This exhibition develops upon work produced by Foster, Roe and Patchett for the 2007 show Out of Time: an exhibition inspired by the arts of taxidermy at the Hunterian Museum, Glasgow, Scotland and on the 2009 exhibit The Plumage Bill: Feathers and Femininity created by Foster and Patchett. To apply this work to a Western Canadian context and Clothing and Textiles Collection new collaborative working relationships were sought and developed between Patchett and Dr Liz Gomez (who has expertise in Western Canadian visual and performative culture) and staff at the University of Alberta’s Material Culture Institute and Clothing and Textiles Collection. Special thanks are due to Dr Beverley Lemire, Dr Megan Strickfaden, Dr Arlene Oak and Vlada Blinova (manager of the Clothing and Textiles Collection) in this regard. Thanks are also due to Blair Brennan of FAB Gallery and Dr Betsy Boon of the University of Alberta Art and Design Department, Dr John Acorn of the Department of Renewable Resources, Dr. Cindy Paszkowski of the University of Alberta Museum of Zoology, Dr Anne Bissonnette of the Department of Human Ecology and Cathy Roy and Jocelyn Hudon of the Royal Alberta Museum. A big thanks to Andriko Lozowy and Will Zimmerman for their artistic and technical support.